The past week was quite entertaining and clearly, there has been a monumental shift in investor sentiment. 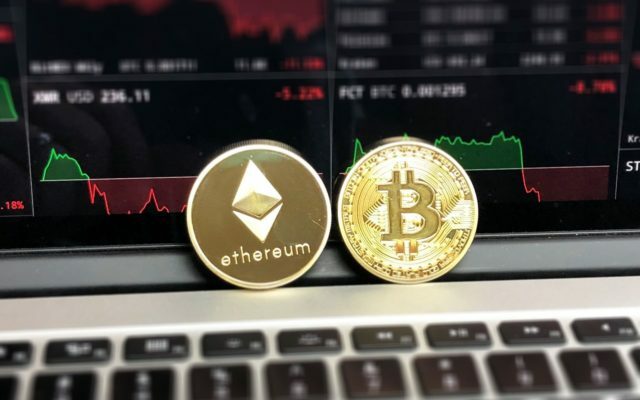 Let’s take a look at Ethereum price analysis as ETH and BTC appear to be taking a breather in preparation for the next move. Bitcoin’s explosive move to $5,300 assisted Ethereum in its run up to $180. This helped set ETH price firmly back on the weekly uptrend. 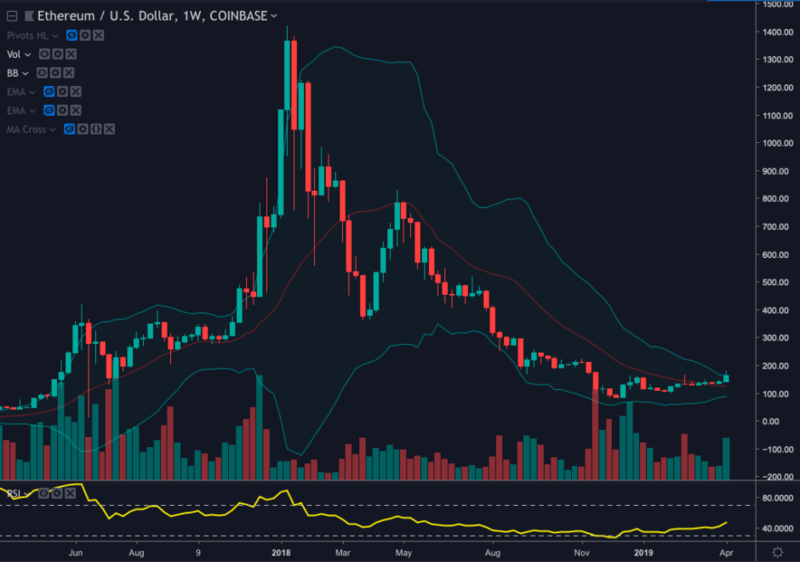 The weekly chart shows ETH positioned outside the upper arm of the Bollinger band indicator, a first since reaching all-time highs in January 2018. The next hurdle will be $225 and ETH 00 appears indecisive as BTC remains pinned to $5k. The successive dojo candles on the 4-hour chart and declining buy volume are keeping Ethereum price trapped below strong resistance at $165 where it has been rejected multiple times. ETH is currently resting on the 61.8% Fib retracement line and above the ascending trendline with support at $162 and $160. Generally, ETH is well situated and has held support from the low of the dump at $150. The RSI is relatively flat in bullish territory. The CMF is beginning to rise and the Stoch is on the verge of dipping into bearish territory. Traders should observe the CMF and volume to keep an eye on funds flowing into ETH. 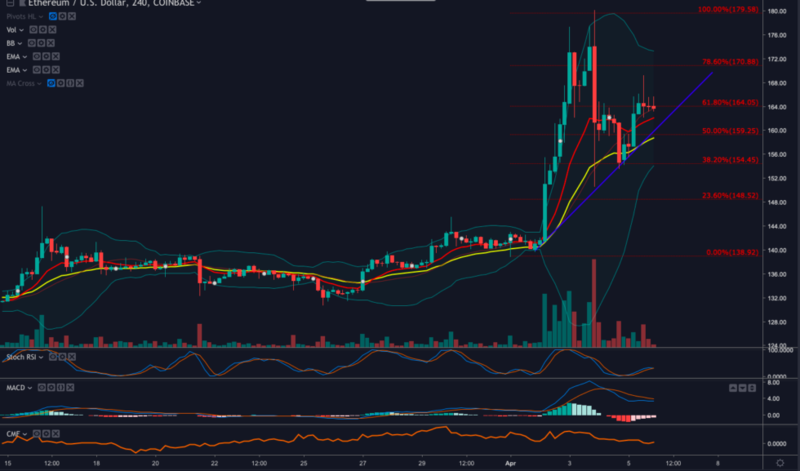 The hourly chart: Ethereum price remains above the 20ma on the Bollinger band indicator and the altcoin needs to gain above the upper arm at $167.89 and the 78.6% $170 Fib retracement level in order to have a second go at $180. Overall ETH appears to be in step with Bitcoin and is likely to follow the path selected by the largest digital asset. 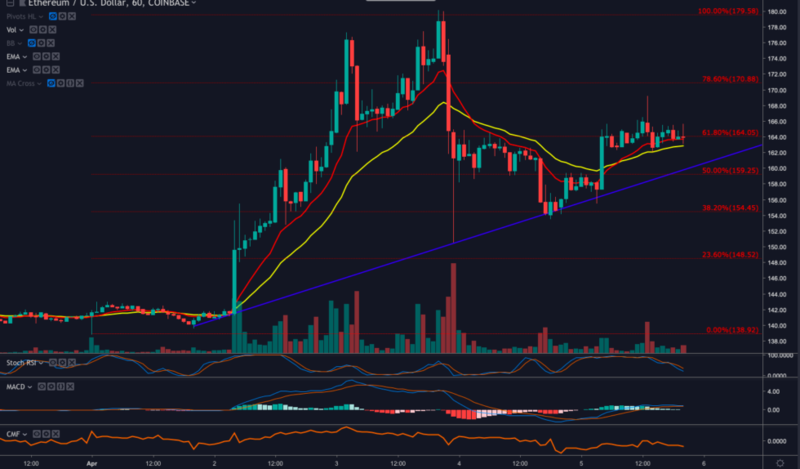 Traders anticipating a Bitcoin price lead breakout could purchase at $164.50 with a stop loss right below to break even in the event that ETH takes a turn for the worse. Where do you think Ether will go over the weekend? Share your thoughts in the comments below. The post Ethereum Price Analysis: ETH Shadowing Bitcoin Price Action appeared first on Bitcoinist.com.